The convenience of air travel means that many of us frequently have to spend time in the confines of an airport. Doing so requires that you have to adhere to specific rules and guidelines, and accept that your failure to do so could land you in a great deal of trouble. Airport security is now more strict than it has ever been, and understanding the reasons for this will enable you to accept that these rules have been set in place for your safety, and the safety of your fellow travellers. Whilst you are in the airport terminal you will have to go through a series of security procedures before you can board your flight. Although answering security-related questions may seem unnerving, failure to give the correct information may result in delays passing through security, which is not acceptable behaviour. You are only allowed to carry liquids, creams and lotions in 100ml bottles so accepting that you may have to throw away over-sized unopened bottles of your favourite products will mean that you pass through the security check area more speedily. You may be asked to remove particular garments before going through the security check machine. Doing so without questioning will speed the whole process along more smoothly. If you are wearing jewellery, and you set off the alarm, you may be asked to remove the items before walking through the security check machine again. If you have body piercings, and body jewellery which may be more difficult to remove, you should mention this to the member of staff who greets you before the security check. Airport and airline staff aim to make your travel experience as enjoyable and stress-free as possible, so being polite and courteous in return should require the minimum of effort. Remembering that any delays to your flight, or travel plans, are not caused by airport or airline crew will help you appreciate that the staff are doing their best to provide a good level of service. If you exhibit aggressive or threatening behaviour however, you could be denied from boarding your flight. Although you are entitled to carry just one item of hand luggage aboard your flight, duty-free shopping may entice you to buy a few treats before you get to your destination. Stowing your purchases, whilst you prepare for take off, may require that you hand purchases to a member of airline staff, if there is insufficient storage space in the overhead locker above your seat. If this is necessary accepting that you cannot hang on to your bags, because they could potentially pose an emergency evacuation problem, will help airline crew help you to travel in comfort. Becoming angry and aggressive, on the other hand, will do you no favours. 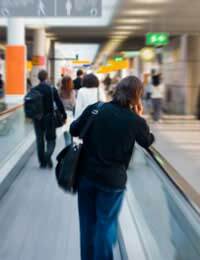 If you have a connecting flight and you have just disembarked a plane that was delayed, you could easily find yourself missing your next flight through no fault of your own. Understandably this will leave you feeling angry and frustrated, but staying calm will enable you to sort out the problem. You will be entitled to board an alternative flight, when one is available, if you are not to blame for the missed flight. However, if you miss a flight because you failed to allow sufficient time for checking in or travelling to the airport you will be entirely responsible for finding, and paying for, an alternative flight.